Even if you consider yourself open-minded, some of the pieces from the Autumn/Winter mens' fashion week 2014 collections in London may give you pause. While women are often seen in so-called "menswear"— trousers, tailored suits, neckties — men in so-called "womenswear" are very rare. And who to say what is only for women, anyway? Writing for The New York Times, noted fashion critic Suzy Menkes declared that the J.W. 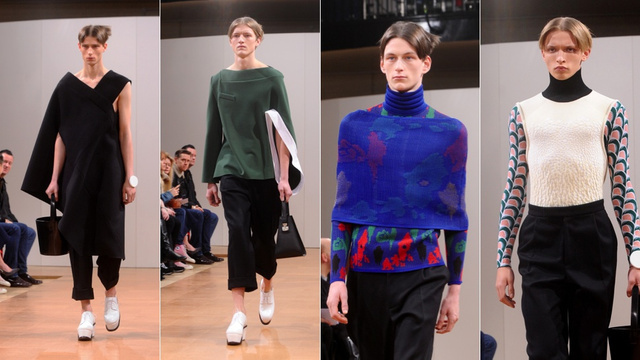 Anderson show on Tuesday "rekindled he masculine-feminine debate in 21st-century fashion." Anderson's collection wasn't the only one: Designs by Astrid Anderson and Lee Roach also pushed the boundaries of what we consider to be "menswear." Boundaries that are, of course, completely social constructs. Go back far enough in human history (prehistoric times?) and you'll find that one-shouldered dresses were a unisex phenomenon. High heels were first worn by men — persian warriors, cowboys, Louis XIV. Drapey desses were worn by men and boys in several different eras, from togas to tunics. And in some cultures and religions, robes and gowns are still acceptable menswear… think of caftans, djellabas, the Pope. But still, some of the designs shown in London are jarring.